The off-season Cleveland has had this year is one of the greatest the city of Cleveland has witnessed. They started out with signing Kyrie Irving to a 5 year $90 million contract extension, this extension will keep him in a wine-and-gold uniform up until 2020. After the signing of Irving they went ahead and drafted Andrew Wiggins from Kansas University. Although he didn’t stay around long Wiggins played a big part in the Cavs off-season. After Wiggins, the man known as LeBron James announced he is returning home to play with the Cleveland Cavaliers. 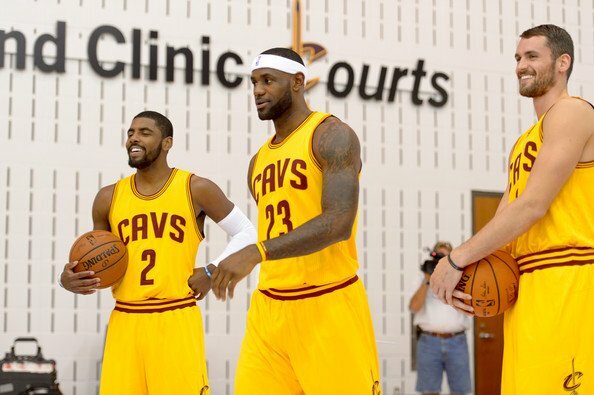 With LeBron in Cleveland it instantly became a hot spot for veterans looking for championships. People like Shawn Marion, Mike Miller, and James Jones also signed with the Cavs. Last but not least the Cavs trade the number one draft pick to the Minnesota Timberwolves for the sharpshooting big man, Kevin Love. With all of this being said there are a few things Cleveland will have to keep in mind heading into this season. There is a phrase commonly used in the sports world, and that is “defense wins championships”. We witnessed this first hand when the Spurs put on a great defensive showing against the Heat to win the finals in 5 games. Both Kyrie Irving and Kevin Love are great on the offensive end of the floor, but when it comes to playing defense some may say they are below mediocre. Kyrie Irving is definitely not a player who comes to mind when someone mentions a defensive point guard. Poor footwork, and vision on the defensive end leads to opposing point guards averaging a 17.8 player efficiency rating up against him. Now when it comes to Kevin Love, he offers basically no rim protection. Opposing teams within five feet of the basket hit 63.1 percent of their shots against the Timberwolves last season. A big part of that number is a lack of defensive awareness from Love. This is a bad sign for Cleveland fans considering they already lack a rim protecting center with Anderson Varejao. I’d say it’s bad if over half of the players in your starting lineup enjoy the ball in their hands. Looking at Kyrie Irving, Dion Waiters, and Kevin Love they are going to find a rhythm early in the season if they want to be successful. It was brought up in the middle of last season that Kyrie Irving, and Dion Waiters don’t enjoy playing together. These young guards will have to coexist with one another in order to be successful, or Dion may find his way to a bench role. Don’t get me wrong, it’s not like these guys are selfish players. All i’m saying is that their numbers are going to have to take a hit in order to be successful. For example, Kevin Love accounted for 26.1 points per game last season for the Timberwolves. If Kevin expects similar numbers, which I doubt he does, he is sadly mistaken. As for Kyrie Irving, he is going to have to be able to distribute the ball better than he has in years past. In order to win, not only will he to be efficient passing the ball, he will also have to cutback on turning the ball over. This past season Kyrie Irving had a 2.28 assist to turnover ratio. He will have to keep the ball more secure in order to keep this offense firing on all cylinders. Looking at the Cavs roster it kind of amazes to see the lack of playoff experience this team actually has. Notable names that have not even played a second in the playoffs are Kyrie Irving, Kevin Love, Dion Waiters, and Tristan Thompson. These are not the only players who have yet to participate in playoff basketball, with all this being said when it comes time for the playoffs, assuming Cleveland makes it in, veterans like LeBron James, Shawn Marion, and Mike Miller are going to have to really step it up in the playoffs and show these young bloods how to get it done in the post season. These young players could very well fall under the spotlight of the NBA post season. Although LeBron James has proven he can carry a team through the playoffs, it very well could be a challenge in Cleveland. Kyrie and Kevin both are great young athletes, but it is just hard to tell how they’ll do in the post season until they’re actually there. After Mike Brown failed to show he is a worthy coach, the Cleveland Cavaliers decided to go after a coach with ZERO NBA experience. The coaching situation shouldn’t be too big of a deal considering they have the greatest player on the planet in LeBron James, who in rough times can act like a coach out on the court. I believe Coach Blatt will carry over his winning ways into the NBA. This past season Blatt was the Euroleague coach of the year, and his team also won a championship.Blatt has also won multiple coach of the year awards in the Israeli league, with five championships. I think it is safe to say Blatt will be capable of carrying his winning ways over to the NBA. I’m not saying these things will make or break the Cavs season, all I’m saying is that you should expect a slow start from the Cavaliers this season. When they finally get things together you better be ready to expect greatness.